The bear is adorable, it is soft and looks very pleasant. The workmanship is wonderful. High quality materials and no loose stitching. 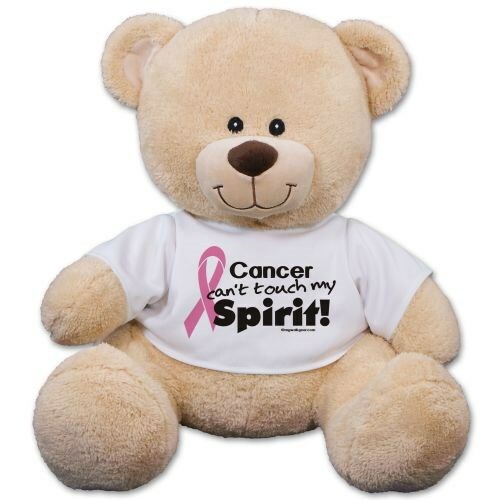 This inspirational Teddy Bear is a wonderful way to honor those who have battled or are battling Breast Cancer. It is the ideal gift that supports any breast cancer survivor, warrior and advocates because breast cancer awareness matters. This inspirational design is featured on our Sherman Teddy Bear. He features contrasting tan fur on the inside of his ears and his snout. He is available in three different sizes, 11", 17" & 21". Free Gift Wrapping and a Free Gift Card are included to create a thoughtful presentation. Additional Details 800Bear.com has many additional Awareness Plush Animals for all of your awareness needs. Be sure to also take a peek at our Cancer Awareness Hope Ribbon and our Pink Ribbon Teddy Bear for any upcoming awareness event you may be participating in.